Before sending your first Zaius email you need to create at least one domain to send from. 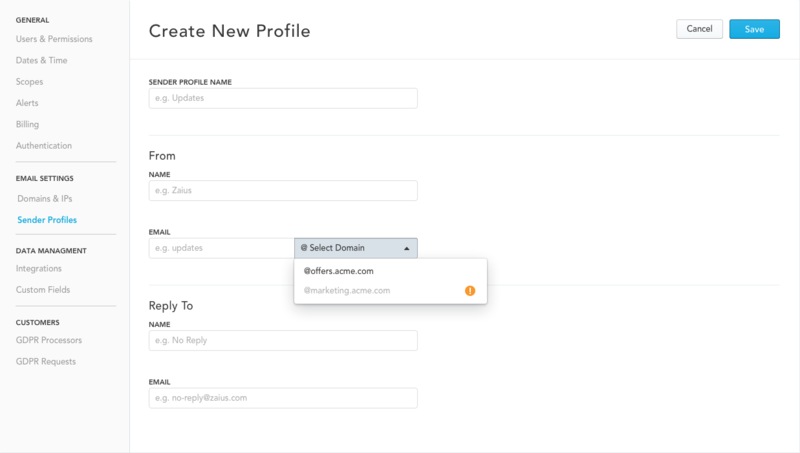 To manage your email domains, visit Account Settings → Email Settings → Domains & IPs. Many customers choose to create two domains for each of their relevant brands. Note: Because reputation is tied to the domain, we recommend NOT adding your root domain (e.g. acme.com) as a mailing domain. If you do so, and you are negatively impacted by poor reputation, all subdomains from that domain will likely be impacted as well. Once you have added your domain, Zaius will need permission to use the domain. To do this, your technical team will need to update DNS records. To do this, provide a login to Zaius or send them the information in the table and request that they update the DNS records as described. You can then click "Verify DNS Records" to check if everything is properly configured. 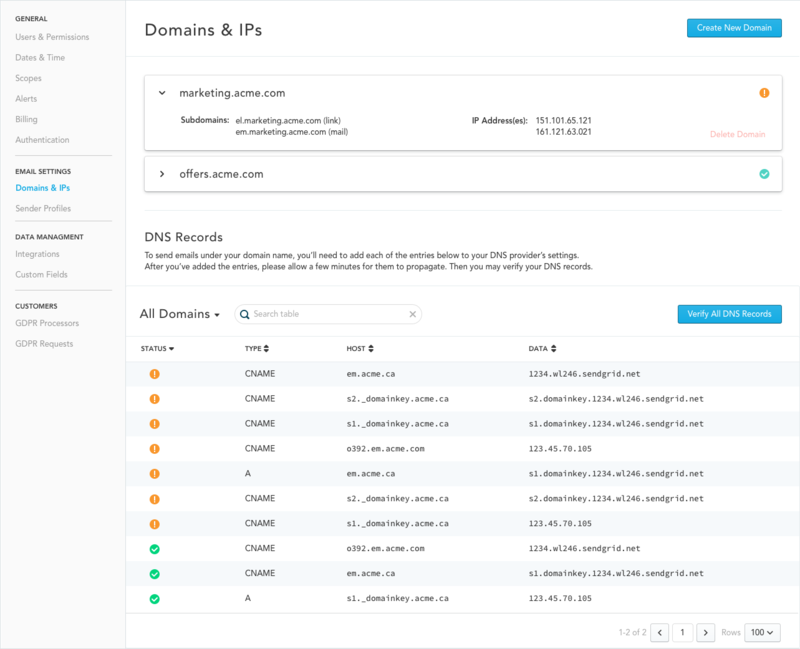 Zaius currently allows you to self-service the creation of two domains. If you need additional domains (e.g. multiple brands), please contact the Zaius Support Team. An additional cost may be incurred. This information when grouped together as a domain within a Sender Profile, is used by email clients to determine your reputation. If you wish to request additional IP addresses or the auto-generated subdomains are utilized by other services, please contact Zaius support for details about custom configuration. Your agreement with Zaius outlines a set number of IP addresses. Additional IP addresses can be added at minimal cost. When creating campaigns via Zaius, Sender Profiles are used to populate the sender information for each message. You can create an unlimited number of Sender Profiles, though most clients choose to create between 1 - 5 depending on their use cases. The From Email in a Sender Profile is what email clients display as the email of the sender. The domain for this email address is one of the domains you created in the previous step. This is how email providers tie email reputation to your company. As for the other values: From Name and Reply-To Name can be any value you choose. Reply-To Email can be any valid email address. Note: If you have created campaigns before October 2018, Zaius may have automatically generated Sender Profiles based on your previous campaigns and added "Auto" to the name. You can use these Sender Profiles or create your own. Now that you've created a domain and connected it to a Sender Profile, let's send your first test message! Select Customers that match a filter and choose any filter. It doesn't matter which one, we're only sending a test message.